Routine engine maintenance and diagnostics can help avoid costly repairs, keep your engine performing at its best, and extend the life of your vehicle. If your “Check Engine” or “Service Engine” light is on in your vehicle, that is a sure sign that your engine should be looked at by a professional as soon as possible. Our highly skilled technicians can quickly diagnose the issue and perform any necessary repairs. Other signs of engine trouble may be rough idling, knocking, stalling, pinging, or slow-cranking, a decrease in gas mileage, and loss of power. If you are experiencing any of these issues or are in need of a tune-up for your vehicle, give us a call at 301-829-8600 or stop into Four County Import Service in Mt. Airy for the best engine diagnostics and repairs in the area. 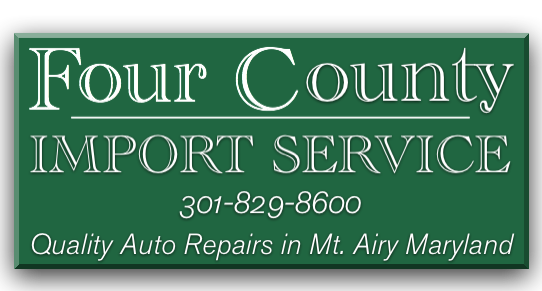 Four County Import Center Mount Airy, MD and surrounding areas in Montgomery County, Howard Count, Frederick County, and Carroll County with quality engine diagnostics and repairs for all makes and models of vehicles.